Inspired by a television series, Sarah Nutt has converted her family’s Birmingham flat into a dressmaking school. Zoe Chamberlain reports. Sarah Nutt grew up above the whirl of sewing machines coming from her parents’ shop below. She knew as soon as she left school, she would join the family business, along with her sister Debbie. Now, inspired by BBC TV programme Great British Sewing Bee, Sarah has converted their Boldmere family flat into a sewing school. And she’s hired Sandra Lavender, a finalist from the show, to run weekly dressmaking classes. “I lived above the shop as a child,” says Sarah, 37, who now lives in Tamworth with her husband Jason Porter. “I felt very privileged because it meant I had my family around me all the time when I was growing up. “I always knew I’d go on to work in the shop after I left school, I never knew any different. I’d always been involved in sewing exhibitions and so on. Using what was our family home as a sewing school makes it a lovely venue as there’s a kitchen and people comment on how light and airy it is, especially as there’s a garden at the back. After leaving the army, Sarah’s grandfather Stephen opened a sewing machine shop on Alum Rock Road in Saltley in 1949. The family lived on the premises and it was here Stephen’s son Les developed a passion for sewing machines. In 1967, Les bought a detached shop and house on Chester Road in Boldmere and the business became L&M Nutt Sewing Machines. He took care of repairs and service whilst his wife Mary looked after sales. S.Nutt sewing machine shop in Saltley, in the 1950s. Just like her father, Sarah grew up surrounded by sewing machines. “History has a funny way of repeating itself,” says Sarah, who now manages the shop for her parents, who are both 69. “My grandfather passed away before I was born. “My sister Debbie has a 12-year-old son called Lewis. Hopefully he’ll carry on the family business too. Understandably, the industry has changed a lot over the years. Sarah explains: “When the shop first opened, the sewing machines could only do straight and zig-zag stitches. Now the machines can download patterns from the internet and supply speed reports and so on. General interest in sewing has changed over the decades too. Sarah says: “People made a lot of their own clothes in the 1960s but they weren’t interested in patchwork quilting or crafting, which is now hugely popular today. “For many people it is a social hobby. Sarah Nutt&apos;s grandfather Stephen in army uniform. “We run a regular Tuesday patchwork quilting class and the women who come to that have become great friends. There haven’t been any men coming to the classes yet but hopefully they will in time. The Great British Sewing Bee has brought about a huge revival in people wanting to make their own clothes, according to Sarah. “More and more people are wanting to make dresses now,” she says. 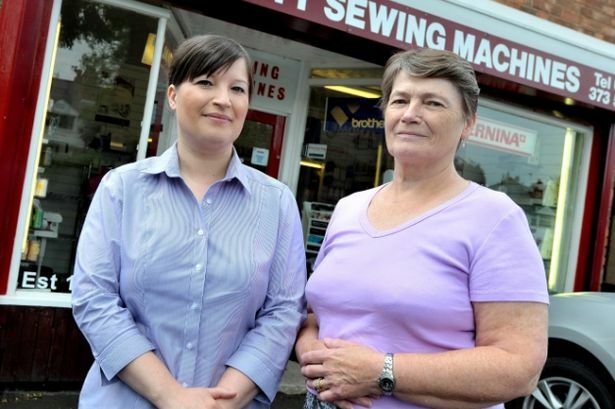 “It’s clear to us because a lot of younger people are coming to buy sewing machines, which is great for our industry. “I wanted someone who was down to earth to run our dressmaking classes. “When I saw how bubbly Sandra was on the programme, I thought she’d be perfect.